and Noel Calvert. Sitting, in front: Francis Foster (cox). Observe the crew’s tartan-patterned Hall cap and the crescent on the jackets (except on the spareman’s jacket). Courtesy of the Master and Fellows of Trinity Hall, Cambridge University. Here Göran R Buckhorn continues his story “Rebels on the River” about famous and less know mutinies in the Blue boats. Read Part 1 here. I stumbled across the 1898 Cambridge mutiny when I was doing research for my book A Yank at Cambridge – B. H. Howell: The Forgotten Champion, which was published in 2015. The following is based on the book. In the autumn of 1894, Benjamin Hunting Howell, of New York City, was admitted to Trinity Hall, Cambridge. Howell had not rowed in America, but with his 6 ft. 5 in. and 12 st. 8 lb. (196 cm and 79.8 kg) and his long, strong arms and legs, he was destined to soon be out boating on the Cam. In 1895, the Lent Races were cancelled due to the Cam being frozen for seven weeks – it was even possible to skate from Cambridge to Ely. Trinity Hall’s first eight had their first races at the May Races in which they easily defended the Head from the previous year. There were three new members in the crew, among them Hunting Howell in the ‘6’ seat. Encouraged by their newly won Headship in the May Races, the Hall decided to go for the Grand Challenge Cup at Henley Royal Regatta that summer. The Hall coach, Henry Tudor Trevor-Jones, ‘T-J’. The crew was coached by Henry Tudor Trevor-Jones – known to the oarsmen as ‘T-J’, who was a real character. In 1875, at the age of 20, he came up to Trinity Hall and rowed in some successful second and third boats, but he never made it to a Hall’s first boat. After he had taken an MA degree in 1882, Trevor-Jones tutored pupils at his home at 3 Trinity Street. 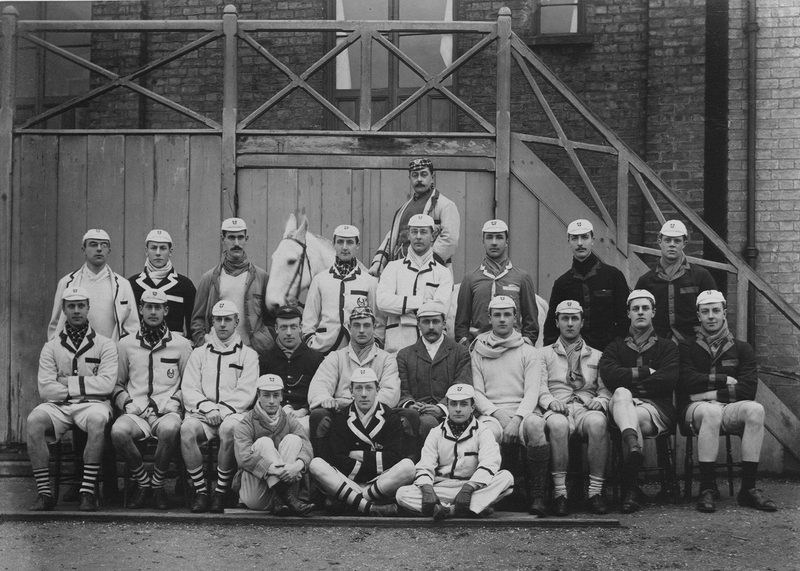 Henry Bond wrote in A History of the Trinity Hall Boat Club (1930) that Trevor-Jones ‘every afternoon for many years was to be found at the river tubbing men and coaching crews from the back of an ancient white horse, called Sultan, popularly supposed to be nearly as old as his rider’. Trevor-Jones coached many Hall crews successfully, but he was less victorious coaching Light Blue boats. Trevor-Jones had his ‘weaknesses’, Bond mentioned in his book, as he ‘had strong prejudices against certain persons and certain boat clubs, and these it was next to impossible to remove, with the result that there were now and then difficulties between the Hall and other clubs’. But not only would problems arise with other clubs, as the Hall coach ‘sometimes also failed to hit it off with the Hall boat captains, and the coaching of the crews suffered in consequence’. The 1895 Henley Royal Regatta was rowed between 9 and 11 July, a Tuesday, Wednesday and Thursday, three hot days with occasionally strong winds on the first day. Despite some interesting races, the year 1895 has gone down in the history of Henley Royal Regatta for one particular race, a ‘scandal’ that involved Leander Club and Cornell University, the first American eight to compete in the Grand. Along with the Cornell crew was their coach, Charles Courtney, who had once been one of America’s best scullers, first as an amateur and then as a professional. As a coach, Courtney was a strict disciplinarian, which he proved during the voyage to England. His oarsmen were not allowed to fraternise with any of the other passengers aboard SS Paris, especially not the young ladies. The American oarsmen’s isolation continued when they arrived at Henley, where they were not to socialise with the spectators or the other competitors. Courtney also avoided talking to the other coaches at the regatta. His crew rowed with a fast, short stroke and with no body swing, which seemed unusual on these waters. Leander had had a four-year-run winning the Grand, and Charles W. Kent, the stroke of the Leander boat those years, was expecting to triumph for the fifth time in the 1895 Grand. In the first heat, the Hall defeated the London RC without any problems, leading at Fawley and crossing the finish line two boat lengths ahead. In the second heat Eton beat Thames RC by slightly more than a length. In the third heat Leander was to row against Cornell. At the start, the Leander crew looked comfortable at the stake boat on the Berks side. There was a wind blowing off the Bucks side and when the umpire, Colonel Frank Willan, called out: ‘Are you ready’, some members of the English crew called: ‘No!’ Colonel Willan seemed not to have heard this and sent the crews off. The Americans started immediately, while a few oarsmen in the Leander crew took a stroke or two, and then stopped, expecting the umpire to call back Cornell for a restart. Willan, however, thought that Leander had made a bad start and did not call back the Americans, who at one point eased off on their strokes to see if Willan would stop the race. But he waved at the Americans to continue, which they did. The umpire launch followed Cornell over the course and gave them the victory when they crossed the finish line, with Leander still sitting at the stake boat at the start. 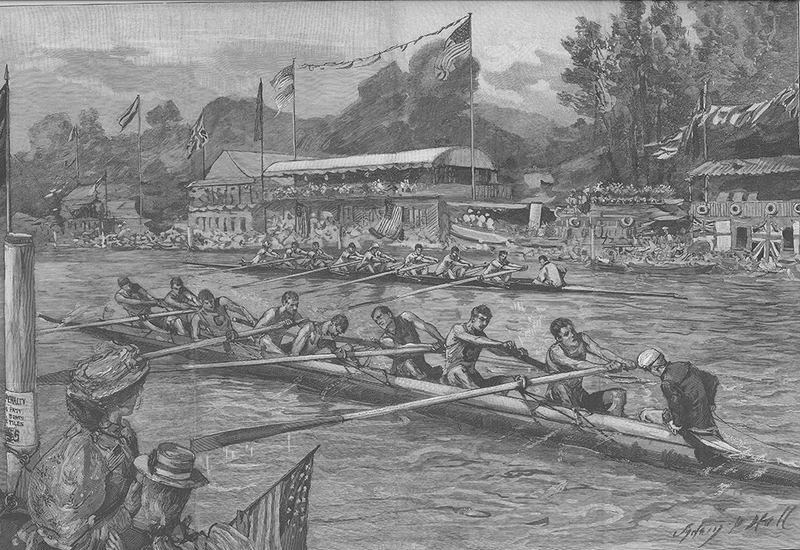 According to American newspapers, 5,000 American spectators had found their way to Henley that day to cheer on Cornell. At first, the Cornell crew was met with applause coming down the course, but when it was clear that Leander did not even start, which, as a matter of fact, was the verdict Colonel Willan gave the umpire at the finish line, this became an extremely unpopular victory for the young Americans. The English part of the large Henley crowd was outraged, and the English newspapers accused the Americans of unsportsmanlike behaviour as they did not stop rowing when they saw that Leander did not start. For the home crews it had been a somewhat unwritten Henley rule for a boat which was ahead of another boat to stop if the crew saw that their opponents were in trouble, catching a bad crab or being interfered with by a punt or pleasure boat. Of course, the Cornellians, who were abroad for the first time in their lives, knew nothing about this. Coach Courtney had taken ill that day and was not on board the umpire’s launch to stop his oarsmen, had he wanted to. Aboard the launch were the American Ambassador Thomas F. Bayard and some American journalists, which might have been the reason why Willan was unwilling to stop the race. How the race was conducted and its outcome just added to the already poor reputation of the isolated Americans and their professional coach who wanted to win the race at all costs, not giving Leander a fair chance, or so it was expressed in the English press. The New York Times mentioned the day after the race (on 10 July) that it was an ‘unfortunate heat’. The day after the ‘unfortunate heat’, ‘English justice was done’, Chris Dodd writes in his Henley Royal Regatta (1983). 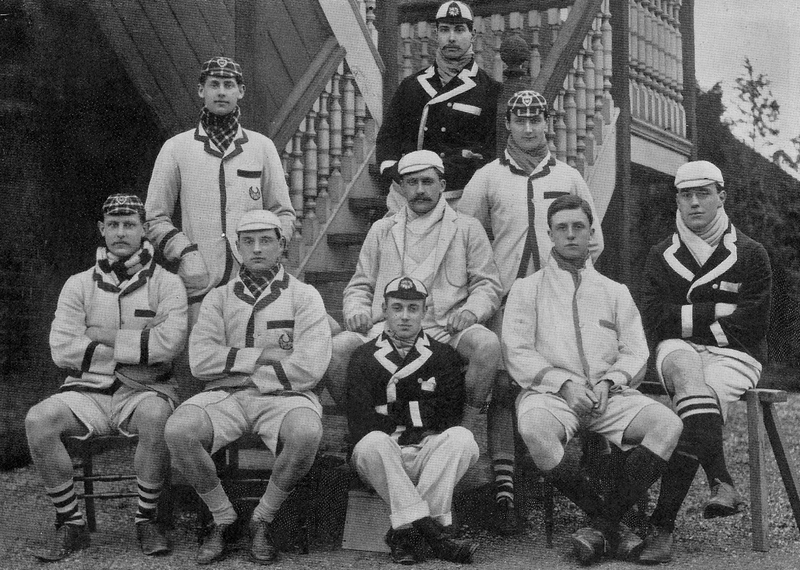 The Hall met Cornell in the semifinal and the Cambridge college crew ‘pulled past Cornell at the Mile Post and got a verdict of “Easily” after the American crew broke up in disarray and exhaustion by the time they reached Phyllis Court’. The Hall crew’s victory was greeted with delight among the English spectators, and in the evening the town was very boisterous with, Richard Burnell writes in Henley Regatta: A History (1957), ‘the all-too-obvious, distortion of the battle-cry, “Cornell, Cornell, I yell Cornell”, and the newly coined counter-cry of “The Hall, the Hall, I bawl the Hall”’. In the final race of the Grand, the Hall raced New College, after the Oxford crew had defeated Eton in an earlier heat. The race between the Hall and New College was grand. From start to finish the crews alternated leading and there was never more than a half-length between the boats. At the end, the Cambridge boat managed to hold on to a slight lead and won by a third of a length. Among the winners in the English crew was one American, Hunting Howell. Later in the year 1896, towards the end of Michaelmas term, oarsmen from the different colleges’ boat clubs, including Howell and some of his fellow comrades from the Hall, practiced to try to make it into one of Cambridge’s two Trial Eights. There were oarsmen from Jesus, Peterhouse, Caius, First Trinity, Third Trinity, Emmanuel, Trinity Hall and Lady Margaret. On 26 November, The Cambridge Review published an article about the sixteen oarsmen and two coxes who made it into the two eights. The unnamed writer left some tough criticism of most of the oarsmen and their style. Hunting Howell rowed in the second boat on bow side as ‘5’, and about Howell the author wrote that he ‘is not rowing up to his best form. He has been sculling of late, which seems to have upset him rather and that with a change of sides and absence from bad health makes it scarcely fair to criticize him too severely. He is a very hard worker’. On the Trial Eights race day, on 5 December, the American proved to be a hard worker, indeed, as it was his boat that won the Trials. Sixteen oarsmen and two coxes proudly wearing their ‘Trial caps’ for the Cambridge Trial Eights race on 5 December 1896. Back row, left to right: (unidentified), C. R. Pattison-Muir (Caius), S. V. Pearson (Emmanuel), Sultan (the horse), D. E. Campbell-Muir (Trinity Hall), coach H. T. Trevor-Jones (on the horse; although at times a difficult man, ‘T-J’ was a devoted coach for the Hall), (unidentified), J. E. Payne (Peterhouse), H. E. Oakeley (Jesus) and G. A. Crane (First Trinity). Front row, left to right: G. T. Bullard (Trinity Hall), B. H. Howell (Trinity Hall), C. M. Steele (Trinity Hall), (unidentified: ‘old oar’? ), A. S Bell (old oar, Trinity Hall), W J. Fernie (old oar, Trinity Hall), C. D. J. Goldie (Third Trinity),(unidentified), R. B. Etherington-Smith (First Trinity) and H. G. Brown (First Trinity). Sitting in the front, left to right: W. H. G. Woodroffe (Emmanuel), P. Cave-Moyles (Caius) and F. E. Foster (Trinity Hall). Courtesy National Rowing Foundation. It is interesting to see who is not in the photograph. One oarsman, who had not rowed for Cambridge before, did not have to row in the Trials Eights to get a seat in the 1897 Light Blue boat, William Dudley-Ward. His reputation as a ‘good oar’ at Eton had preceded him when he came to Cambridge in the autumn of 1896. The boat builder Matt Wood of Putney had fitted up one of Cambridge’s clinker-built practice boats with nickel rowlocks, while the boat builder Aylings had sent a new set of oars. The Times reported that the crew went for an outing in the boat, accompanied by their coaches Stanley Muttlebury and Henry Trevor-Jones. After the crew came back to the dock, the two coaches consulted with president Bell about how to continue the rest of the day’s practice, as was the custom at this time when the president, not the coaches, was the man in charge of the crew. In February, Trevor-Jones and the Cambridge crew were visiting Oxford. Stepping into a punt, the Cambridge coach slipped so badly that a muscle snapped in his knee and his kneecap was twisted out of place. Trevor-Jones being out of commission, the Cambridge crew’s training were left in the hands of president Bell and coach Muttlebury. 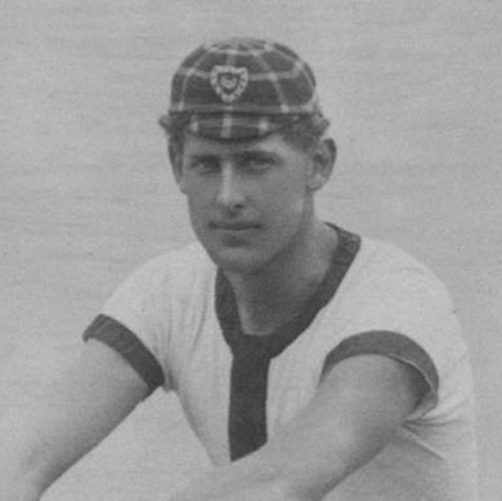 Stanley Duff Muttlebury had been one of England’s best oarsmen during the late 1880s and rowed for Cambridge in five Light Blue crews, becoming a true legend, winning the Boat Race in 1886, 1887, 1888 and 1889, and losing in 1890 – he was the president of Cambridge University Boat Club the last three years. Muttlebury, who was a large, strong man with good manners, was an enormously kind fellow. Affectionately known by the Cambridge rowers as ‘Muttle’, he not only swept rowing medals and cups at Cambridge, he was equally successful at Henley, though he never won the Grand. Many decades after his active rowing career was over, Muttle was still regarded as ‘the greatest oar ever produced by Cambridge’. On the morning of Boat Race Day, a chilly wind remained from the previous evening’s cold weather. Rain clouds moved in, which led to a cold, light drizzle before the race, set to start at 2:15 p.m. In the middle of the day, huge crowds of people moved around the banks of the Thames to head for Putney, Hammersmith, Chiswick, Barnes, Mortlake and other favourite spectator spots along the course. More than the usual number of steamers, tugs, barges and rowboats were moving upstream on the river. Only four steamers were allowed to follow the two eights when the contest was on: one from each university, one for the umpire (which also took the coaches and other ‘Old Blues’) and one steamer for the gentlemen of the press. Cambridge won the toss and chose the Middlesex station. With their choice of Middlesex, Cambridge hoped for an early lead, giving them the inside of the first bend at Craven Steps. As the challenger, Cambridge embarked first, a little late at 2:15 p.m., closely followed by Oxford. Cambridge paddled down to Putney Bridge along the Surrey shore and made a wide row across the river before they came up on the Middlesex stake boat. Oxford, who rowed in a new eight built by John H. Clasper (Harry Clasper’s son), paddled mid-river to their stake boat, which was anchored to the Surrey side. Each of the stake boats had a waterman waiting for the eights to dock their sterns. 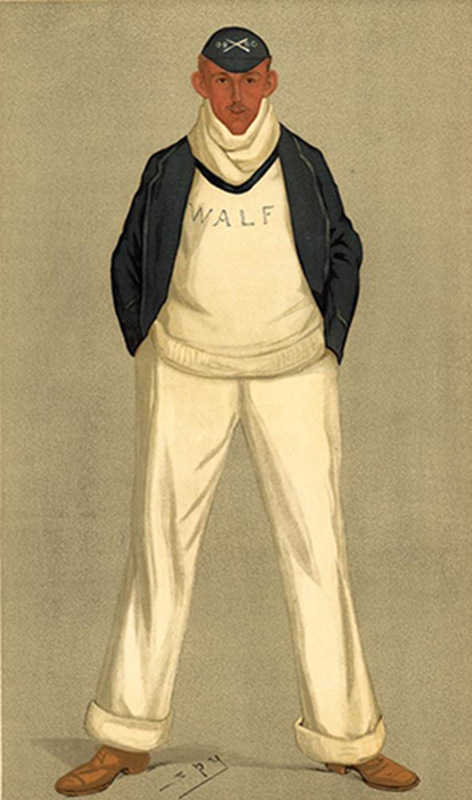 Umpire Colonel Willan (four-time winning Oxford Blue in 1866-1869 and the same man who had made a mess of Leander and Cornell’s start in the Grand at Henley two years earlier) gave both crews a couple of words of warning before he raised his pistol, with which he sent off the two boats. The Dark Blues came to the race as favourites. Two weeks earlier the bookmakers had Oxford at odds of 3 to 1 on, but on race day they had them at 5 to 1 on, which was a given bet. Earlier during practice, the Oxford crew had set a new course record at 18 minutes 27 seconds. With Howell making the Light Blue boat, he was the second American to row for Cambridge in the Boat Race. 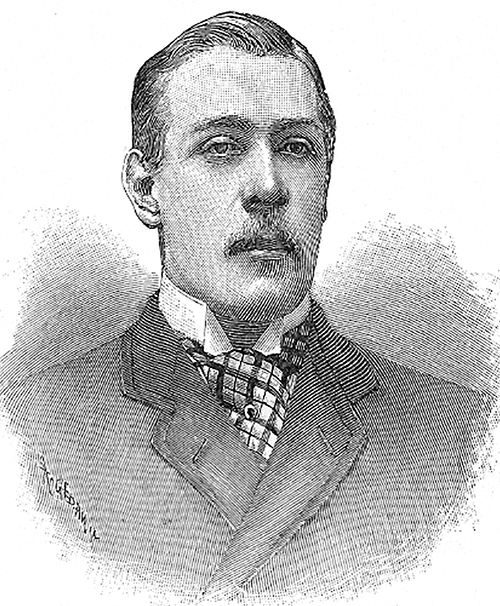 John Endicott Peabody, of Harvard, had been the first American, in 1873, when Cambridge had won by three lengths. With the wind coming in from east-south-east and with a good running tide, the rowing conditions were going to be fast. After the start, the Light Blues took a slight lead rowing 20 strokes in the first half of the first minute, then 17 strokes for the second half of the first minute, settling to a rate of 34 strokes a minute. This to be compared to the Dark Blues’ 18 and 36. However, Oxford soon increased their stroke rate, so by the Mile Post, they were one second in front of Cambridge. At the Crab Tree, Oxford had slightly more than a canvas lead and now they began to push harder. Passing under Hammersmith Bridge, Cambridge was almost a full boat length down, and with Oxford rowing beautifully well together, it would be hard for Cambridge to catch up. The Dark Blues were still ahead at Chiswick Reach and Eyot, and passing Chiswick Steps, they had a nine-second lead. It did not help that Cambridge put in a spurt now and then; Oxford had a comfortable lead, which at Chiswick Church had become four lengths. Thereafter both crews came into rough water due to a strong wind, and Cambridge did not manage to close in on their opponents. According to an article in The Times, at this stage Oxford were ‘not doing more than a strong paddle’ with 31 strokes per minute, while Cambridge did nearly 35. At one point the Light Blues felt the wash from the Dark Blue’s bow side oars, so cox Caesar Hawkins steered his boat over to be directly behind Oxford’s boat, some three lengths down. ‘It was a case of follow my leader thence to Barnes Bridge, reached by the Oxonians in 16 min. exactly, Cambridge being 11 sec. in the rear’, The Times wrote. Coming out of Barnes Bridge, the crews were met with a fair wind that followed them to the finish. Oxford kept a steady stroke at 32 and crossed the finish line at 19 minutes 11.4 seconds, two and a third boat lengths ahead of Cambridge who put in a spurt at the end, passing the finishing post with a rate of 38 strokes per minute. The Light Blue crew that raced against the Dark Blues on 3 April 1897. 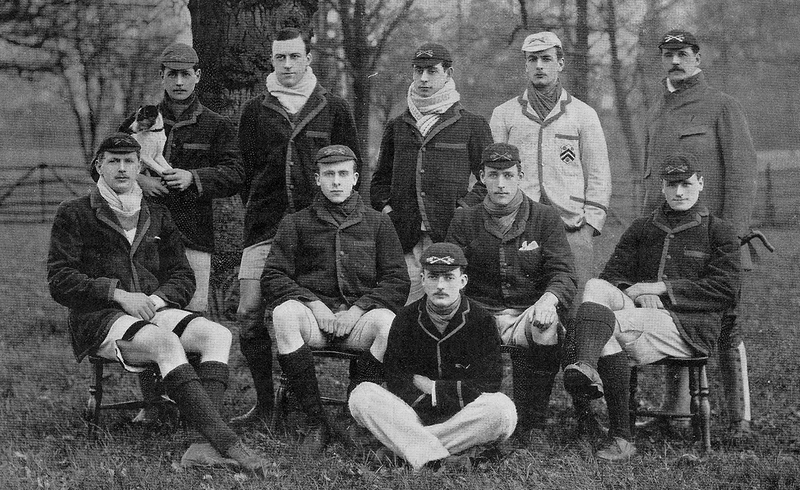 Back row, left to right: B. H. Howell (4, Trinity Hall), E. J. D. Taylor (3, Caius; dark jacket), W. J. Fernie (stroke, Trinity Hall; sitting) and D. E. Campbell-Muir (bow, Trinity Hall). 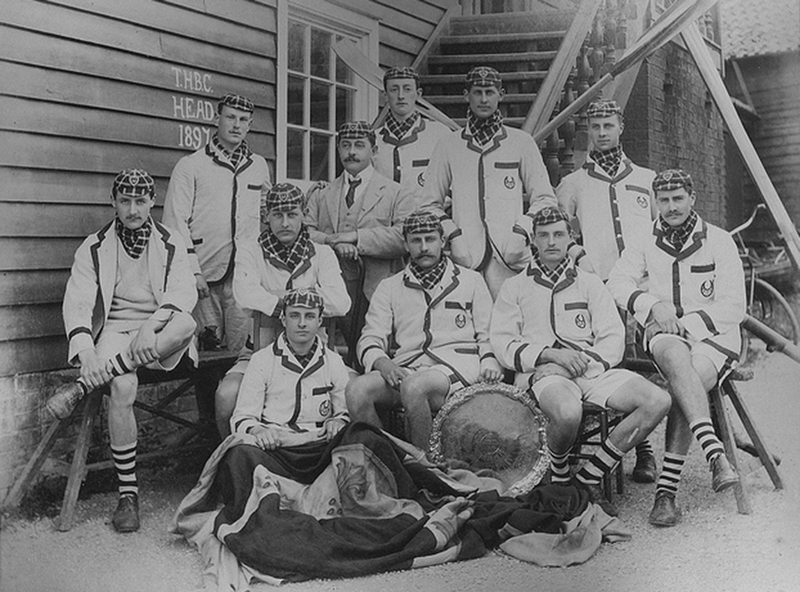 Front row, left to right: W. A. Bieber (5, Trinity Hall), A. S. Bell (2, Trinity Hall), E. C. Hawkins (cox, Caius), W. Dudley-Ward (7, Third Trinity) and D. Pennington (6, Caius). 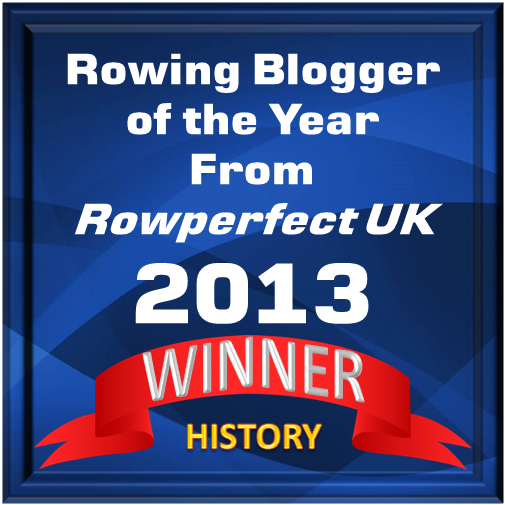 ‘The finest crew that ever rowed’ – the 1897 Oxford crew. Standing, back row, left to right: J.J.J. de Knoop (New College), R. Carr (Magdalen), H.G. Gold (stroke; Magdalen), G.O.C. Edwards (New College), D.H. MacLean (coach), sitting, left to right: C.D. Burnell (Magdalen), C.K. Philips (New College), W.E. Crum (New College), E.R. Balfour (University College), in the very front, H.R.K. Pechell (cox; Brasenose). Howell and his fellow Cambridge oarsmen had made a brave effort to overtake the Dark Blues, who won their eighth consecutive race. However, Cambridge had not just competed against a good Oxford crew, they had raced and lost to ‘the finest crew that ever rowed’. After the Cambridge loss in the Boat Race, coach Trevor-Jones found it necessary to publicly explain why the Light Blues had lost again. He did this in a signed article published in The Cambridge Review in April 1897. In his piece, Trevor-Jones writes that among Cambridge’s ‘disadvantages’ and problems were, a) that Eton oarsmen went to Oxford, not Cambridge, b) ‘it is impossible to maintain a light and lively style on the thick and shallow waters’ of the Cam, c) he felt personally ridiculed by anonymous writers in magazines and papers like Truth, Isis and others, d) Cambridge got no help from Old Blues, with the exception of Muttlebury, e) and, here he was really asking for trouble, the ‘present cramped and stilted style’ of First Trinity men is such, that ‘when they get into mixed crews, they fail utterly to assimilate with the members of those crews’. A response from William B. Close, of First Trinity, was rapidly published in The Cambridge Review in late April. Close had rowed in three Boat Races: a losing crew in 1875, a winning in 1876 and the dead heat race in 1877. Although Close in the beginning of his letter called Trevor-Jones ‘my friend’, he then used two and a half pages in The Cambridge Review – these were the days when a magazine editor did not shorten a letter writer’s ranting – to strongly oppose Trevor-Jones’s views, using the most explicit language. Close only partially agreed with one of Trevor-Jones’s five reasons for Oxford having been more successful than Cambridge during the 1890s and that is ‘the ready-made Eton oars [are] going to Oxford’. However, the First Trinity man thought that Cambridge should ‘make their own oars and not look for ready-made oars’. Cambridge president William Dudley-Ward depicted by ‘SPY’. In all this chaos, Close saw only one solution. There was already a saviour among the Cambridge oarsmen, at least the way Close pictured it. 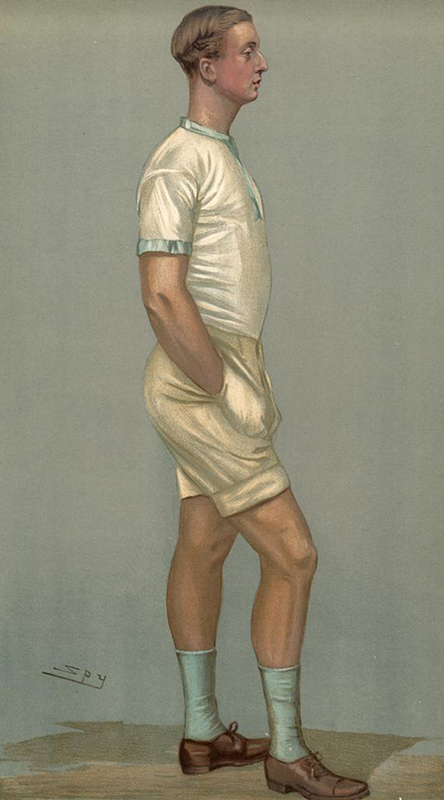 The man to save rowing at Cambridge was the freshman, William Dudley-Ward of Third Trinity, the ex-Captain of the Boats at Eton: ‘I sincerely hope that he will be the next President of C.U.B.C.’, Close wrote. Oxford has accomplished this difficult task, thanks in a great measure to what may be called the system of universal coaching […] Not a little of Oxford’s success is due to Mr. Fletcher’s insistence on this principle. There is scarcely a boat on the Isis that has not learnt the elements of the Eton style from Mr. Fletcher himself, and most of the other coaches have followed him in putting aside to some extent the interests of their separate colleges. It would undoubtedly have surprised the writer of the article if he knew that a year later William Fletcher would actually coach Cambridge’s Blue boat. In May, Country Life wrote in another article saying that William Dudley-Ward had been elected president of Cambridge University BC, which ‘seems to give satisfaction both in Cambridge and outside it, holding out a hope of a reinvigorating change, of which Cambridge rowing at this time seems to be in peculiar need’. However, in spite of the high hopes that emerged with Dudley-Ward’s presidency, there were some rumblings of discontent in the ranks. Regardless of Dudley-Ward’s record as a fine oarsman at Eton, he was still in his first year at Cambridge and some of the oarsmen at Cambridge, presumably mostly the Hall men, thought that it was William Fernie who should have become president. Coach William Fletcher depicted by ‘SPY’. To make things worse, at least in the eyes of many Cambridge oarsmen, for the 1898 Boat Race president Dudley-Ward brought in Oxford coach William Fletcher to coach Cambridge. Fletcher had rowed for the winning Dark Blues in 1890, 1891, 1892 and 1893, and had a large number of pots from Henley. Because of this bold move Dudley-Ward ‘encountered great opposition, several men refusing to row’, Chris Dodd writes in The Oxford & Cambridge Boat Race (1983). In February 1898, the rift peaked in a meeting at the Goldie Boathouse between the captains of the boat clubs. The famous oar and coach Rudie Lehmann had been invited to take the chair. President Dudley-Ward complained that Hunting Howell, now captain of Trinity Hall BC, and his crew mate Adam Bell refused to row in the university boat. Howell was also accused of influencing other Hall oarsmen not to row. Raymond Etherington-Smith, of First Trinity, chimed in saying that he had had a conversation with Howell who wanted Fernie as president instead of Dudley-Ward. Howell denied that he had influenced any rower not to row for Cambridge. After this, Bell returned to his position as number ‘2’ in the boat. Howell did not, however, join the crew. It is not known whether he was asked to row in Dudley-Ward’s crew or if he refused to take part. Nowadays, this is a forgotten dispute in the history of the Boat Race, but it made Howell the first American ‘mutineer’, who preceded the more famous rebels at Oxford in 1959 and 1987. Indisputably, William Fletcher was a brilliant coach and did greatly improve the Cambridge crew in spite of only having three Old Blues in the boat, Dudley-Ward, Bell and Hawkins, the cox. But the crew was struck with misfortune. Getting closer to race day, the stroke Charles Steele went down with influenza and could not row. Then, the president was ordered by his doctor not to row. It was a reluctant Adam Bell, now the ‘old man’ in the crew, who moved from the ‘2’ seat to the stroke seat. On race day, 26 March 1898, the weather was ghastly. The tide was strong and a blizzard swept over London. Icy rain came down on the Thames and a ‘crop of white horses’ were seen on the Surrey side. Oxford won the toss and picked the Middlesex station, which left the Light Blues in the unruly water on the Surrey side. After half a dozen strokes at the start, the Cambridge boat was filled with water. They moved over to the shelter on the Middlesex side, but by the time they were behind Oxford, their boat was waterlogged. For the rest of the race, the Cambridge oarsmen were sliding back and forth in the icy water in the boat. The cox Hawkins sat still in the cold water with a bitter wind and needle rain stinging his face. 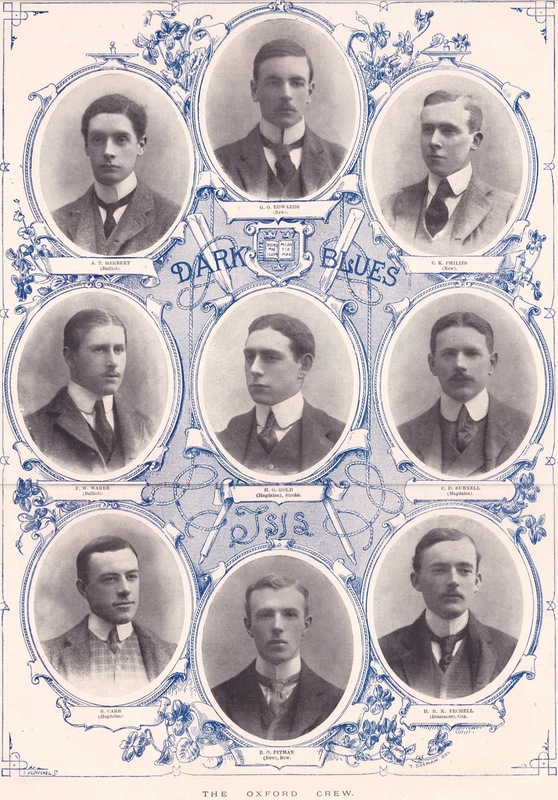 The 1898 Dark Blue crew. Top row: A. T. Herbert, G. O. Edwards, C. K. Philips. Middle row: F. W. Warre, H. G. Gold, C. D. Brunell. Bottom row: E. Carr, R. O. Pitman, H. R. K. Pechell. Oxford won the race in 22 minutes 15 seconds with Cambridge 44 seconds behind. ‘The remarkable thing’, Henry Bond wrote, ‘being that Cambridge rowed in good form from beginning to end, never going to pieces or getting ragged’. This was the Dark Blues’ ninth consecutive victory. 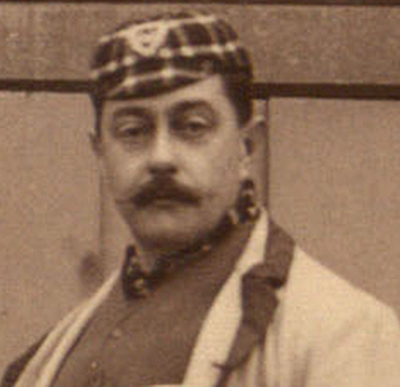 Dudley-Ward returned to the Cambridge crew in 1899, when the Light Blues managed to break the Dark Blues’ winning streak. He also rowed in the winning Cambridge crew in 1900. What happened to Hunting Howell? Not rowing in Cambridge 1898 crew, he thereon concentrated on the single sculls. He won the Diamond Challenge Sculls at Henley both in 1898 and 1899, and also the Wingfield Sculls these years – but that is another story.